Leak Tester for Flexible Packaging is designed to detect if food and pharmaceutical packages are correctly sealed. Package leak testing ensures standards are maintained during packaging development, machine setup and production on an assembly line. The TSE6086b works on the principle of vacuum decay, where a pressure difference will generate a leak flow from higher pressure to lower pressure. A testing package is rapidly placed under a vacuum, and then isolated, so that any leaks allow a return to atmospheric pressure. The time to create the vacuum is then used to identify large (or coarse) leaks. Similarly, the rate of decay of the vacuum towards atmospheric pressure is used to identify small (or fine) leaks. The main requirement for a successful application is to have a head-space of air (or modified atmosphere) in the test package. The Sealtick TSE 6086b / TSE 6081b uses a vacuum method to measure the gas leakage for a wide range of flexible pack types and sizes. Items are placed manually, and the handle is closed to initiate a fully automatic test sequence. 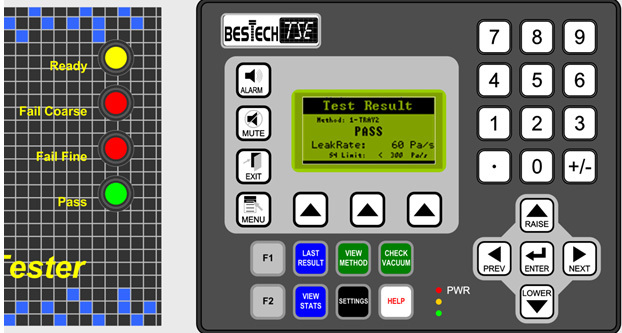 Results are displayed as a Pass or Fail, along with a quantitative measure of the leakage rate. The testers are fast – as short as 3 seconds – objective, easy to use and reliable. They do not stress the package, are dry and non-destructive. Methods can be modified, and stored. For ease of operation and traceability, there are menu prompted diagnostic functions and calibration routines. Results are logged into a spreadsheet importable format for trend analysis. There is a Web/Ethernet interface for both remote monitoring and log retrieval, and an optional USB interface for log retrieval. At last, under water testing and manual bag squeezing are things of the past. Used for MAP packs, salads, biscuits, milk powder, medical bandages, pharmaceuticals and the list goes on. For more details on TSE6086B or TSE2032 visiting Sealtick website. Please complete the enquiry form below for specific information and advice on Flexible Package Testing Equipment.